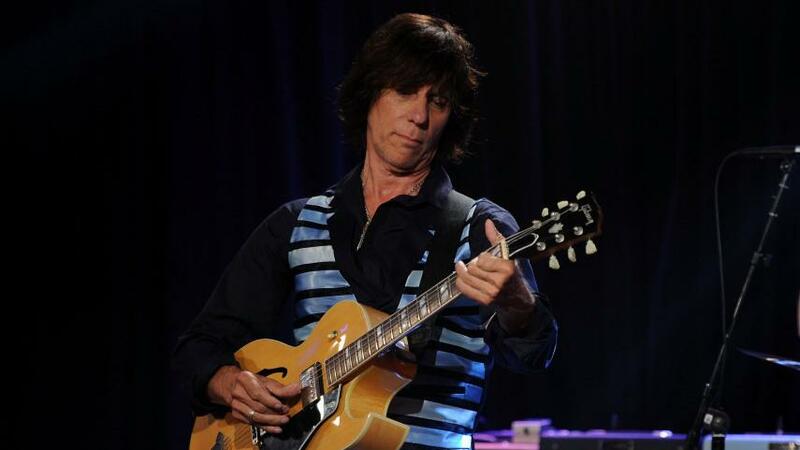 Jeff Beck performs at Les Paul's 95th-birthday party at Iridium Jazz Club on June 9, 2010, in New York City. Over the years, World Cafe has seen its share of guitar gods. Today's session revisits three of these astounding artists: Les Paul, a pioneer in the electric guitar; Peter Frampton, celebrated for his innovation with the guitar talk box; and Jeff Beck (one of our favorites), known as the "guitarist's guitarist." Starting with Paul, today's World Cafe examines some of the instrument's greatest innovators. Les Paul started modifying the guitar by age 8. He began professionally recording in the 1930s, then constructed "The Log," the granddaddy to solid-body electric guitars and pioneered the use of multi-tracking on records. In this 1992 session, Paul recounts his first glimpse of Jimi Hendrix and the process of making the first electric guitar. Later, guitarist and songwriter Steve Miller reflects on Paul's legacy. Next up is Frampton, whose name became synonymous with the talk box, a device that allows speech to be recorded over the guitar. In this conversation from 2004, Frampton details his discovery. Finally, Jeff Beck was on the show in 2010 to discuss his latest release, Emotion and Commotion, and his 40 years as a musician. Since picking up the guitar as a young child, he's created a variety of bluesy rock, heavy metal, jazz fusion and electronica with a deft touch. He's worked with the likes of Stevie Wonder, Cyndi Lauper and ZZ Top, and has been inducted into the Rock and Roll Hall of Fame twice. In this interview, Beck describes his orchestral approach to his 2010 release and recounts working with Eric Clapton. This segment originally aired on October 5, 2011. Copyright 2013 WXPN-FM. To see more, visit http://www.xpn.org/.